HellermannTyton's Spirit™ 2100 portable printing system is easy to use and features "What You See Is What You Get" (WYSIWYG) label design and creation on a LCD screen that shows the outline of the label. Just type in the text (which is displayed on the screen), choose from several print sizes, and press the print button. It's that simple! The printer automatically detects the label and determines the proper size template for easy editing. The Spirit 2100 provides fast, high quality, thermal transfer printing for permanent and highly legible label printing. 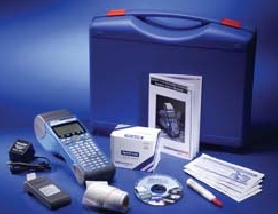 The Spirit 2100 prints on many different types of label materials for wire, cable, and component marking. Self-laminating, white and metalized polyester, and tamper evident materials for calibration and security labeling are available for use with the Spirit system. 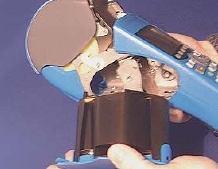 The ribbon is supplied in a self-contained cartridge for easy loading. One ribbon per package. Weight: 2.5 lbs. - Shipping Weight: 7.5 lbs. Mark patch panels or terminal blocks with the Spirit's vertical print option (when used with a continuous media such as label TAGHTP-336). "What You See Is What You Get" (WYSIWYG) label design and creation. The label will print just like it looks on screen. Choose from normal or bold fonts to complete the label design appearance. Automatically centers text during label editing process. Print with popular barcode symbologies including Code 39, Code 128 and EAN. Vertical print option for patch panels, wall plates, terminal blocks and wire markers. Print serial numbers on labels with the "serial" text type. Spirit 2100 will automatically remember the last serial number printed the next time the saved label is used. The ribbon is longer than the industry standard which translates into fewer ribbon change-overs. Battery powered and a convenient hand strap makes the Spirit 2100 extremely portable and accessible. AC adapter also available. Label sizes and user interface upgradable in the field. Auto "fill" feature to copy one line of text to all other lines on the label.